I would like to share the experience of my Brother's fiancée (Ms.Uma Keerthivasan) being an Ardent Lord Sai devotee. Three years ago when we were in Godavarikhani and when I was in my Graduation, My younger sister Bharathi was a great Devotee of Sai and she painted a SAI Image and kept it in POOJA room. My sister believed on SAI very much and used to pray Sai daily and she got a seat in M.C.A. She asked me too to follow SAI and asked me to do "Sai's one week PARAYANAM" and Said that I would M.B.A seat. I was very Lazy and I said that I can't do fasting and also I Don't believe in this. My mother forced me and started that "Sai's one week PARAYANAM" That book contains all the stories of SAIBABA and how he helped POOR, DISABLED. Hope you must have read that book. "Sai's one week PARAYANAM" should start on Thursday and should end on next Thursday, In this entire week we have eat only once and Sleep on the floor and on the final day of this pooja we have remain in fasting and have the food after offering the food to most wanted Beggar or poor person or a Person who cannot afford to have Food. It is written in the book if we give food to a person Suffering from Leprosy or a Handicapped or a very hungry beggar, BABA will be very happy and he will come to our house in the some or the other form. So on the final Thursday I was fasting and was waiting for a Beggar so that I can give food, But in that place Sighting a beggar was very rare and nobody came that day. I was waiting near the gate till 3 PM. then my mother told me to give the food or Servant as She was also poor, But I didn't agree I said she was poor but she can afford to buy vegetables and prepare lunch and have it. I wanted a Handicapped person I was very determined and made up my mind that I was end this fasting till I find a Suitable person. Mummy was forcing since my elder brother who was very close to me was waiting was my lunch at last mother told to keep some food aside for a poor beggar and have my lunch. I told that I will a last glance and went to the gate and found a Very old lady was passing by and she was handicapped and she was the right person. I called her and said that today I did Sai Baba's Pooja and asked her to have the Lunch in our house. She was very happy and she said that she did not have food from past few days my sons are very bad and they don't take care of me & they have sent me out. and she was moving her handicapped hand so that I can notice. Mummy asked from which place she is coming and belong to and she told that our native place is GodavariKhani which is also our Native place. We felt so pity on her and my second brother asked her to come daily to our house and have the lunch here itself. We gave her prasadam, rice, poori and everything we prepared. She ate only prasadam and said that I will take the rest in the evening, I told her I will give you food for evening also, and have the food here itself. She said NO NO I ATE PRASADAM AND STOMACH IS FULL. She thanked us so much for giving food and she went off. First we came inside and my brother said we will find Address So that we can send food, we came outside only in the matter 15 to 20 seconds gap, but we could not see her. From our gate we can see people coming and going for almost Half Kilometer. she was very weak and it has taken her almost 1 Min to come from previous house to our house but we could not trace her we tried a lot even by coming outside. Then we thought it was Saibaba who came to our house in the form of a OLD LADY and I was very happy. From that time I started worshipping Sai Baba and I got a M.B.A seat. Wow really a great miracle. You are so lucky to have a such miracle. Really she is so lucky to have our SAI leela.. it was a wonderful SAI leela.Thank you so much for posting here your Experience with our SAI. Thanku Subhasriniji for sharing this miracle with us. baba sai can never be upset with his kids. sai baba is personification of your faith. the more you believe sai, the closer you feel sai natha to you. baba sai is beyond all these angry, etc. baba will never leave his kids. baba is in you and all , even in them who don't believe him. baba is universal mother , the kartha , karma and kriya. he is witness to all of our actions. so brother, believe sai, once you have unshakable faith on sai baba, you will never feel down, beacuse, failure or success are baba blessings to us. have faith on baba, you faith should be beyond all these failures and success, that is call "surrender to baba". have confidence in yourself, beacuse it is baba sai in you. develop this belief. baba will be with you. baba is with you. baba is our faith. that is why baba asks dakshina of" shradha and Saburi". offer yourself to baba. rest sai will take care. beacuse you are baba's responsibility. I have a bit of confusion, i hope you all will help me in that. I read it some where in the forum that BABA never preffered Fasting or Starving. Then why are we keeping these fasts? I am sorry if i did offend some one. Forgive me for that. I am in a dillema, and confused with all these. I would like every ones suggestions and feedback on this. Happy Mahara Sankranti to you and all your family members. Fasting todtally depends upon person to person. On thursday it is usually Sai baba who is worshipped. In fact, Baba never recommended fasting on empty stomach. So, just avoid salt & spices on this day. It depends on your mental ability. Ashtotharam and also Sai charita. There is a story that a devotee asked Baba how to fast. "At noon on Thursdays, eat half of what you normally eat. Then pack a lunch and deliver it to a poor person. "Yes, there is a homeless lady in your city. Give the lunch to her. he wants more concentration & devotion than fasting. Gokhale’s wife came to Shirdi with some devotees known to Dada Kelkar. She stayed in his house. She desired to undertake fasting for three days and be with Baba. But Baba told her, "Mother, there is no need to undertake fasting. Go to Dada Bhat’s house, prepare puranpolis (sweet stuffed chapatis) and feed his children and you also eat." On that day Bhat’s wife was indisposed. Hence, Baba’s advice appeared to be timely. Accordingly to his advice she prepared puranpolis, served the others and ate some. Fasting is only a method of regulating the digestive system and nothing more. To think that one gets some divine benefit from that is only a misconception. Apart from not getting any benefit, fasting makes a person weak with the result that one cannot attend to one’s normal duties. Those who worship Baba can take food and then worship him. Sai bless you always. I would like to share an experience that happend to me in 2003. I passed out Computer Science and Enginnering in 2003. I was searching for a job once I passed out desperately. It was so imporatnt to me as we were in a position fully dependant on my earnings and I was the bread winner of my family. I tried attending many aptitude tests in many companies but could not get through. On October 18th 2003, I left roughly around 7:30 for a walk-in interview in Loyola College in Chennai. The college was so crowded that it was so difficult to even get the form to fill for the aptitude test. Once I got the form I filled it and all of us were redirected to take the aptitude test. We took the aptitude test in the afternoon and waited for around two hours to get the results. To my joy I found that I has cleared the aptitude test and was short-listed for the technical interview round. I appeared for the technical interview in the evening . Before even I could start wondering whether they would select me or not, the HR came and told me immediately that I had cleared the technical round and asked me to wait for HR round. I was overjoyed and I had to wait anoter 45 minutes for the HR round. I attended that also and I was told they ll intimate the results ASAP. I went home at night and told me mother what all happened. She told me that all the day she was not able to concentrate on her normal work from morning to late evening and she was reading only Sai Satcharitra all the time when I was undergoing the selection process. After few days I got a mail from the HR to collect the offer letter from them. I was one among very few who got a job from a huge crowd of around 10,000 freshers who attended the walk-in. I joined the company the next month. What else other than Sai's grace could have bagged me the job. Today I have completed 3 years in the company and now I am in UK on an overseas assignment. 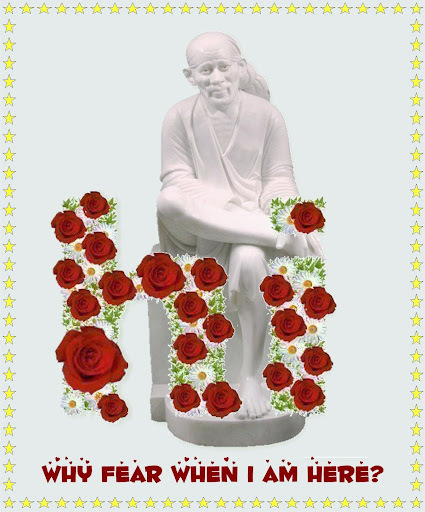 JAI SAI. This is my experience from 22 years ago. That time we were living in India. I was expecting our second child. We tried three times to get a US visa, but it was refused. One day, Sai Baba came in my dream and told me "visa mil jayega," which means "you will get Visa." We were wondering why this would be possible because it was refused three times. One day we got an offer from Canada, which was refused before. The university where my husband was offered a job wanted him to join as soon as possible. For the Canadian visa, a physical exam was required and it takes some time for processing. So my husband went to the Canadian consulate and explained the situation. And to our surprise and by Baba's grace, she said no problem! She told my husband to go straight to the doctor's office and get it done. She called the doctor's office and told them to give the reports to my husband. (Doctors are not normally allowed to give the reports) The next day, my husband had the physical exam, picked the reports and went to the consulate with the reports. By Sai Baba's blessing it was all right and she gave the visa. Next week my husband came to Canada and I joined him after with our two sons. Today, we are living in Canada happily with Sai Baba's blessings. May Sai Baba's blessings remain with all of us. My koti koti namasakar to his holy feet. Let me begin with one of my experiences of baba’s leelas. I am reading satcharita since 3 years. I remain debited to the chapters written by hemadpant ji because of which I am now what I am. I came across a chapter in satcharita where a person leaves his favorite dish unless his wish is fulfilled. It became my habit of practicing this deed from the day I read this chapter. When I was studying mca I thought of leaving cottage cheese (panneer) to baba unless I pass. Finally we got our results and because of babas grace I passed and got good marks. Later on I got a good job and I had some personal problem. I took an oath that I won’t eat panneer until my wish fulfills. Every day I used to be very careful as I have my dinner in the office cafeteria. One day my manager announced overtime and they contributed dinner to each and every one. The dinner was paneer and aaloo roll. My manager brought all the rolls and asked me to distribute them to everyone and take one. I just thought that they are veg rolls and never had an idea that there are paneer rolls in them. I gave all the rolls and took one for me. Now comes the main part. Every one got paneer roll except me. I was amazed and thanked baba for helping me. that is how baba helps his devotees and supports them. om sai ram. thank you so much for sharing such a wonder experience . but i hav question aisa kerney se kya sach main hamari wish pur ker detey hai . ?? kya un tak hamari prayer jaati hai? kuy wo kai baar apney devoties ki itni pariksha letey hai .?? kyu wo unki feriyaad jaldi nahi sun letey ?? Wow it was such a wonderfull miracle.Sueshgaru thanks for email,U re such a good narrater,I like the chapter which u explained (megha's). Page created in 0.344 seconds with 69 queries.